Lots of people ask how many bags does this project need to complete? It really depends on the bags and how you cut them. I cut these bags each 1 inch wide to create the plastic bag yarn or plarn. For the brown bags, I did a calculation to see how far one single bag made into plarn would go on each round. I found that it took about 1.8 bags to crochet a single round on the main body of the bag. I kept a count and used about 53 plastic bags to complete this recycled grocery tote bag. Finished size is 13″ by 13″ with 9 inch handles. I hope my calculations on how many plastic bags are needed for a recycled bag project help people. 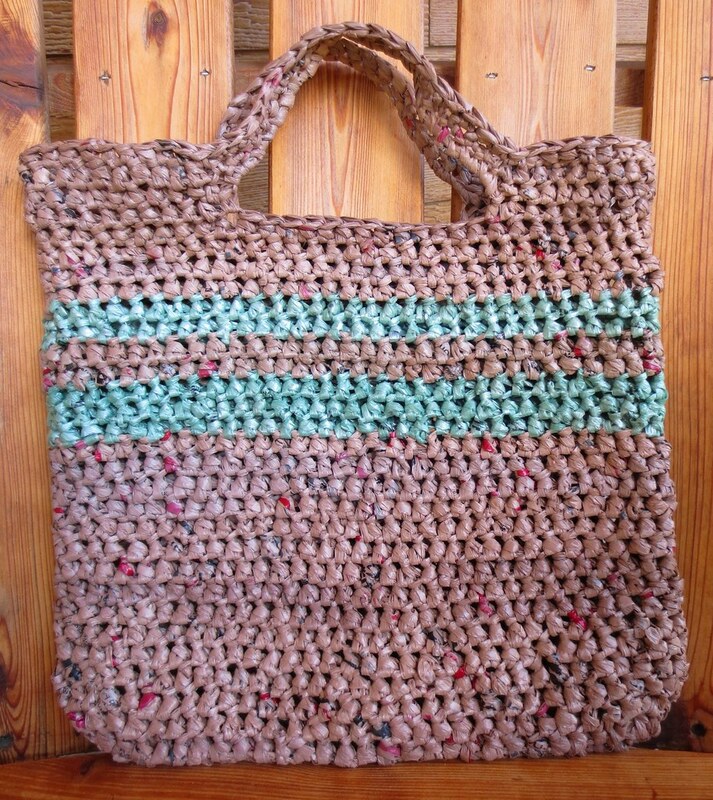 But remember bags can vary and how you cut them and your crochet methods will all add into the equation. So don’t worry too much about the number of bags needed for your project and just enjoy recycling the plastic bags and making something new and useful out of them. I love seeing all the items you create from recycling plastic bags. I found your website a few years back and was prompted to start using plarn. Since that time I’ve made dozens of purses, backpacks and shopping bags from plarn. I donate the backpacks to the local homeless shelter. The men there love the bags and I can barely keep up with the demand. @Jackie – Thank you so much for sharing your plarn making stories. I love hearing from people who use my patterns and help out charities through recycling. Keep up the good work for these worthy causes. I really inspired from your post that you are sharing idea of using plastic bags for useful purpose. Thanks for sharing it with us. Oh My. this is very useful information and this is the very good idea of using plastic bags for good purpose. I like that.